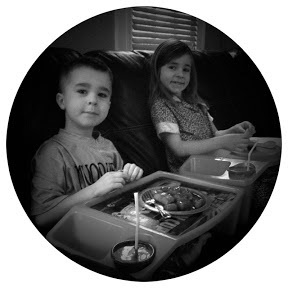 I took this picture this morning of the kiddos eating a lazy breakfast on the couch. I love their sleepy morning faces. I've been sharing pictures with Gary every day because he's been in Florida working. We are ALL very ready for him to come home! 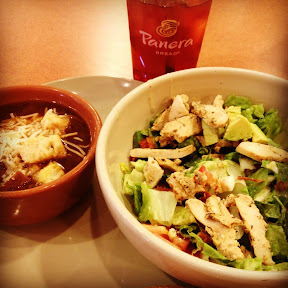 I had a solo lunch at Panera today. I love their french onion soup. Heck, I like all french onion soups and I think I'll add that to our meal plan for next week. I usually make it in the slow cooker and the weather is still cold enough for soup! Mannnnn it was nice to be alone today with no kids. I usually like to be surrounded by people, but today I was thankful for my alone time. Today marks 1 year since Harley went to heaven. I can't believe it's been a year already. 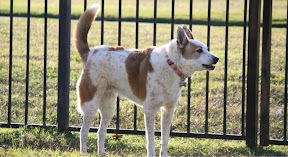 We miss our sweet Harley. Oh how she would hate the cold here in Ohio! I'm hoping to get some good pictures of Daisy and Lily together. Lily is about to blow past Daisy's size. She is growing so fast and is such a stinker. Two dogs and two kids is a lot of work for this momma. Single moms that do it 24/7 all the time are rock stars! I'm ready for reinforcements. I really miss editing pictures and writing my blog posts from my laptop. The battery died and after looking locally with no luck I was forced to order one from amazon. Hopefully it will be delivered tomorrow along with my husband! I love french onion soup too & I only had it for the first time in Oct. We don't have a Panera in BR. They keep saying they're building a couple but nothing yet.